I’m working on a bench for our entry way. I want to build it myself and I wanted to use eco-friendly wood. I found a wood reclaimer in our part of the Valley…more or less so I grabbed P and off we went. A wood reclaiming center is the kind of adventure I love and I am happy to share the experience with P. It’s fun but it can be dangerous. I pointed out to her that all the stacks of wood were not meant to be jumped on. The wood could fall over and we needed to walk around with care. I showed her the nails coming out of boards and explained the danger. What blows me away about P is that at almost 2 she gets what I’m saying. Clearly. She was cautious but still curious. 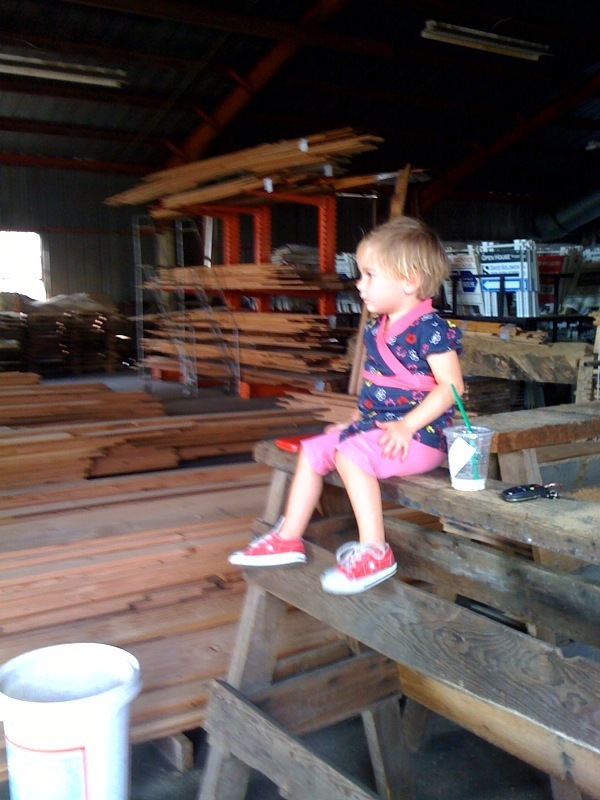 She touched lots of planks. We saw a couple of old, intricate moulding pieces that were beautiful. I think she had fun. I know she loved seeing the plank get cut with the huge saw. P also helped me measure planks. She’s learning numbers and this experience took it to another level. I kept telling her I needed something at least a foot wide. She kept looking at her own foot and I could see she was trying to figure out what I meant. I needed to explain how big a foot was in measurement terms. It’s so amazing. The places we see and the things she learns. I forget that the basic stuff for me is still an entirely new world for her.